According to Activision, enough people played Call of Duty: Black Ops to populate a decent sized country. 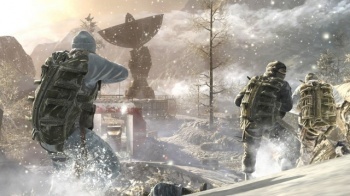 The Cold War is now quite a bit longer, thanks to Activision, Treyarch, and Call of Duty: Black Ops. According to Activision's figures, Black Ops players have amassed 600 million man hours of playtime, which is equal to 68,000 man years. Activision didn't say exactly how many players it had taken to accrue such an enormous amount of time, but said that it was more than the number of people who had watched the Lost finale, and but not quite as many as Texas. This puts the total somewhere between 20.5 million and around 25 million. According to Activision, the 600 million hours averages about to every single player putting in 87 minutes a day, every day from when the game came out on November 9th, all the way up to Christmas Eve, which, as the publisher points out, is longer than people use Facebook for each day on average. Black Ops' biggest competitor, Halo: Reach, accrued slightly less than half of the time of the Cold War shooter in a longer period of time. Of course, Reach is a platform exclusive, so it's not really a like-for-like comparison. In fact, it would be interesting to see how the playtime breaks down across the various platforms, but those numbers don't seem to be something that Activision wants to release.